A What to Eat pad (from KnockKnock) has been sitting in my basement for over a year now, wedged in between a pile of cookbooks and other assorted items marked “Tag Sale.” Of course when I say “marked” I mean not with a Sharpie or a label or anything, but in the back of my own mind; and when I say “Tag Sale” I of course mean “Event that I’ve been trying to organize for six years but really only serves as justification for not throwing things away.” In any case, two weeks ago, the girls found the “What to Eat” pad while they were unearthing tutus from the old dress-up box (also “marked”) and immediately came sprinting upstairs begging me to give it to them. What I told her — and what I ended up writing in the book — was that there are so many things besides the actual making of dinner that go into making dinner happen. For me, the cooking part of dinner is the easy part — dare I say, the fun part. The planning part? Not really. Just because I have four thousand meal ideas recorded in my diary doesn’t necessarily mean I’m brimming with inspiration on any given weeknight. (I’ve yet to figure out why not.) So it’s a huge help for me to have someone else think up a plan. I know I’m not alone — I’ve heard from a lot of you that the think-work part of dinner can often be the most paralyzing stage of the process. So having a partner in any phase of the planning (no matter how diminutive that partner may be) helps make the meal more of a shared family goal than an it’s-coming-no-matter-what burden. This is why I had no problem taking strict orders from our daughters these past two weeks and why the “What to Eat” pads have been rescued indefinitely from the “Tag Sale” pile. I thought you’d like to see the line-ups they came up with. *Abby’s salad = “crispy lettuce” with tomatoes, carrots, miso-ginger dressing. She likes to make this herself. I always think those pads are a good idea, but they end up being dust collectors. I love the idea of eliciting a non-cook … sometimes one of the most stressful parts of making a meal is figuring out what to make! Your daughters have great taste! I have been completely uninspired to plan dinner for the last month. Unfortunately, my husband’s and son’s suggestions normally revolve around ordering a pizza, or something that comes from a box and is shaped like a dinosaur. That pad is a special sort of genius! I’m forwarding this to a friend whose child is definitely a non-cook, stubborn eater! love this post! i happened to ask my daughter what she wanted on this week’s menu (i usually don’t ask, then i wonder why they don’t eat what i make), and she was full of ideas, even suggesting a new recipe to try out. it really makes a difference when you include the kids in the meal planning! On the other hand, that kid has never refused a bite of anything that I can think of, so maybe I shouldn’t be surprised that a strategy that works for picky eaters doesn’t work for him . . . I agree with the “trying to think about what to have” part of making dinner is the most difficult. Please tell me! 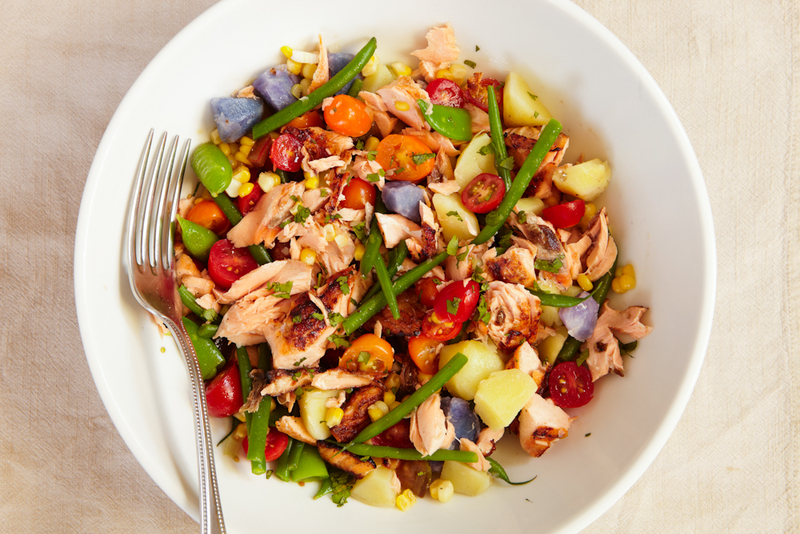 Love your blog, eating more than a few recipes! It’s so true…I’m glad I’m not the only one who struggles with this. I’ve told my husband time and time again that he can ask me to make ANYTHING and I will make it for him. The sky’s the limit; I just don’t want to have to come up with it myself for once. And yet, all he usually says is “uh….I don’t know.” I look forward to the day when my girls are old enough to put in their requests! Brilliant! My husband has been working really long hours the last month and eating at work. Feeling absolutely uninspired on Sunday I asked the girls what they wanted and its helped so much! We’ve had spaghetti, “brown beans” and toast (baked beans), silly supper (pancakes) and eating out. Its been so much easier on all of us and I swear the girls eat better when they help decide. I also love that they requested fairly uncomplicated meals. I might have to invest on one of those tablets and see how this experiment progresses. I’ve created a menu for the “Strom Cafe” that is posted on our refrigerator. It’s a list of commonly made meals that at least one of the kids likes. My goal is that each of my kids gets to pick dinner once a week, I make something that they both like once a week and then one night I get to make something of my own choosing. It seems to work well because the kids know that at least once a week they’ll get to eat something of their own choosing. Christine – I think I’m going to have to adopt that system. It makes so much sense! Now if we could only get them to COOK the meal they choose…then we’ll be in business. I love these ideas. Organizing dinners for a modern family is so hard. I think the best advice I ever received was to always have something that everyone will eat- even if it’s a whole wheat pasta with butter or a vegetable that everyone will eat. Each week I try out one new recipe (at least) and rotate the ones they love like turkey tacos, pork chops or spaghetti with meat sauce. Then I can mix in my one new choice along with some sides I know they will eat. They don’t seem to mind much when it is sandwiched between foods they enjoy. I adore these pads. 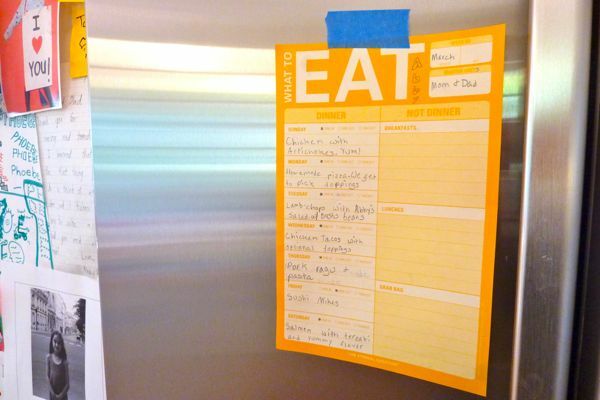 We’ve tried to keep our menu on Evernote, which is where we keep our grocery list, but we need a piece of paper on the fridge. That’s how we roll. We usually do our meal planning at Sunday breakfast. We sort out our calendar, marking down if anyone will be away for a meal, if any meals involve guests, need to be fast, etc. We settle upon whether my husband or I am to cook each night. Then everyone gets to request a meal. Then we fill in the rest, based on complexity, seasons, leftovers, what sounds good, and what recipes I’ve recently bookmarked. My husband resisted this at first, but then he found himself cooking things that were far too complex for a weeknight. Now he knows to participate or get stuck with whatever I choose! I love your enlistment ideas for the non-cook. Reminded me of a funny story from Jenna McCarthy’s hysterical book: “If It Was Easy, They’d Call The Whole Damn Thing a Honeymoon.” She talks about when her husband grills, everyone oohs and aahs over the fact that he “made dinner.” Yet she itemizes all the time she spend meal planning, shopping, prepping and cleaning up — which eclipses the 7-10 minutes he applies fire to the food. That’s really fun. We had been trying for awhile to plan our meals for the week ahead, and it made things so much easier until we forgot to keep doing it. Agreed that it can be kind of hard to come up with ideas on the fly, especially when you’re already standing dazed in the grocery store. Thanks for the fun example. Completely true point about the meal planning. If my husband and kids would fill out my meal planning board every week and all I had to do was shop and cook for it, I would consider my job easy! Just found your blog today and I will certainly be back! I’m looking forward to the book. It looks fabulous!